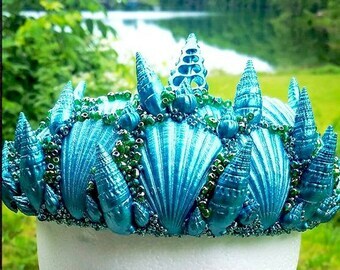 Announcement Welcome to PYAARA, your source for handmade special occasion hair flowers, hat pins, feather fascinators, hair sticks, yarn falls, and other unique adornments. 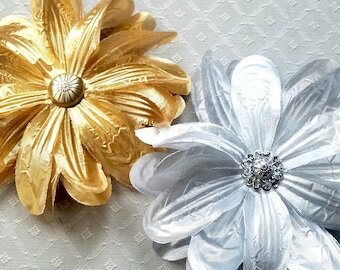 I also create cameo hair flowers and jewelry for https://www.etsy.com/shop/ArchetypeStudios in many themes. Please check it out! Thank you so much for your business. 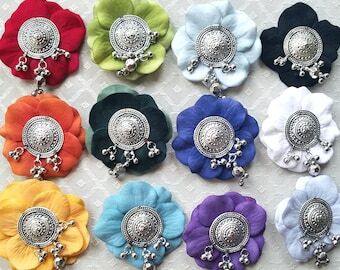 xox Kara M.
Welcome to PYAARA, your source for handmade special occasion hair flowers, hat pins, feather fascinators, hair sticks, yarn falls, and other unique adornments. 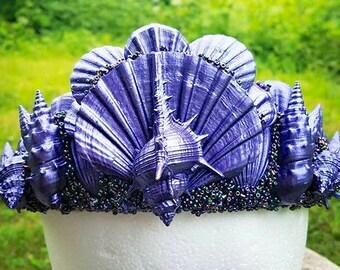 I also create cameo hair flowers and jewelry for https://www.etsy.com/shop/ArchetypeStudios in many themes. Please check it out! Thank you so much for your business. 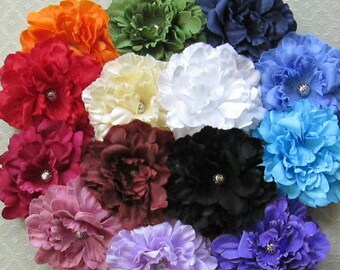 xox Kara M.
Deluxe Peony Hair Flower Clip & Pin - 10 Color Choices! 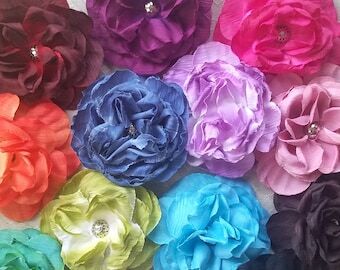 Crispy Peony Hair Flower Clip & Pin - 12 Color Choices! 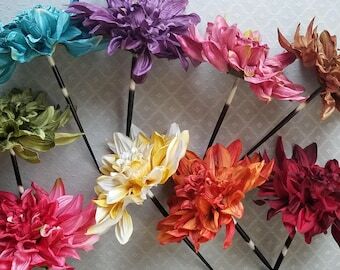 Dahlia Hair Flower Clip & Pin - 15 Color Choices! 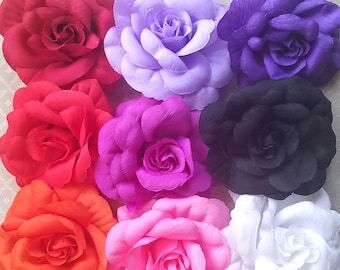 Garden Rose Hair Flower Clip & Pin - 13 Color Choices! 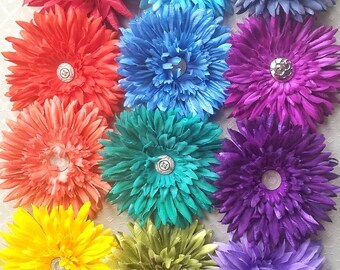 Daisy Hair Flower Clip & Pin - 19+ Colors/Styles! 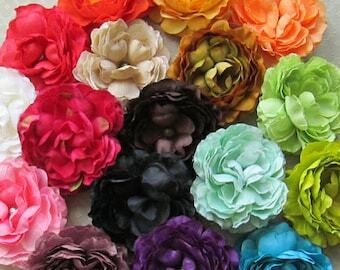 Ruffled Ranunculus Hair Flower Clip & Pin - 21 Color Choices! 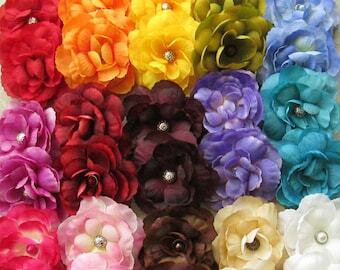 Ranunculus Mini Hair Flower Clips/Pins - 17 Color Choices! 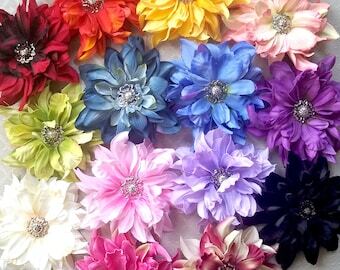 Delphinium Mini Hair Flower Clips/Pins or Shoe Clips - 20 Color Choices! 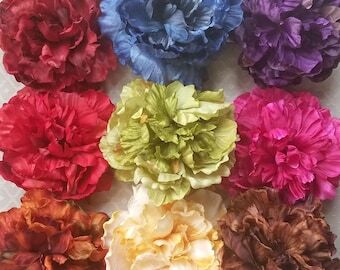 Hydrangea Mini Hair Flower Clips/Pins or Shoe Clips - 20 Color Choices! 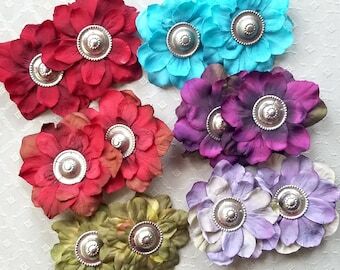 Daisy Mini Hair Flower Clips/Pins or Shoe Clips - 17 Colors/Styles! 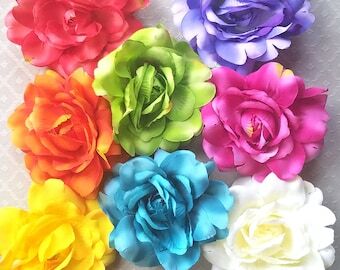 Rainbow Hair Flower Clip & Pin or Headband - THE PRIDE COLLECTION! 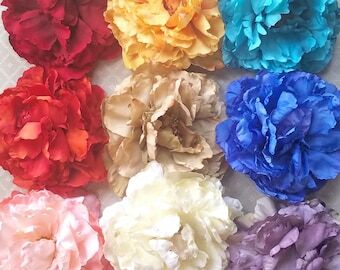 Simple Peony Hair Flower Clip & Pin - 18 Color Choices! 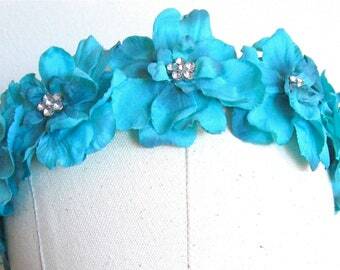 Delphinium Headband - 11 Color Choices! 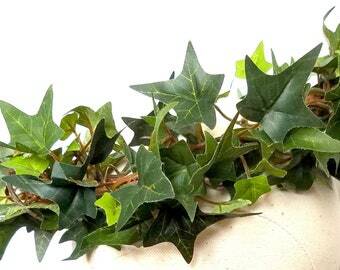 Lovely product, good communication with vendor, and she kindly included a small gift with my order. I will order something else from this shop soon! 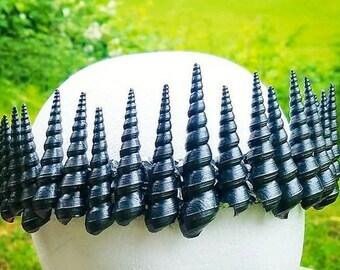 As a tribal belly dancer, medieval history enthusiast, and a fan of burlesque, pin-up, goth and steampunk styles, I love creating beautiful and romantic accessories. PYAARA was born so that I can share these designs with you for your special occasion, performance, or costumed event. I do not allow typically refunds or exchanges. However, if any items in your order arrive damaged or arrive defective in any way, I will happily repair or replace them if you contact me ASAP after you receive them. I accept PayPal only. Deliveries to NJ are subject to a 7% sales tax. Orders placed during the week are typically shipped 1 to 3 days after I receive your payment; orders placed over the weekend ship out first thing on Monday. U.S. orders usually ship within 1-3 business days with free tracking via USPS First-Class Mail; packages typically take about 2 to 5 business days to arrive. The exception to this are my yarn falls, which are made to order and are quite heavy. Thus, yarn falls ship within 1-2 weeks, and are sent via USPS Priority Mail in the US and USPS First-Class Mail internationally. Signature confirmation and delivery insurance options are available upon request. For items other than yarn falls, shipping upgrades to USPS Priority Mail are also available on request; packages shipped Priority arrive in 2 to 3 business days. International orders ship via USPS First-Class Mail International, which typically takes about 7 to 21 days to arrive, depending on the country. Posted rates are estimated; any significant difference in actual costs will be refunded to the buyer immediately after the item ships, and/or applied to a shipping upgrade if possible. Please convo me for more information or if you have a preference. 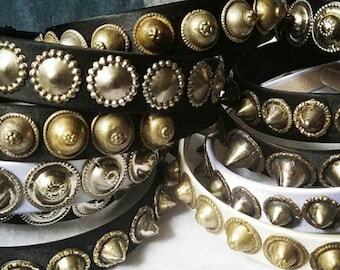 Whenever possible, I will combine multiple items into one package to save on shipping costs and I will refund any significant difference to the buyer. 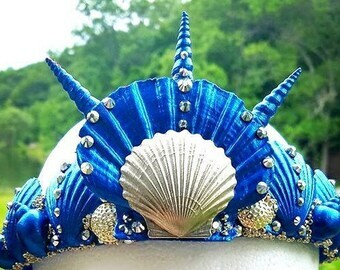 I will also combine shipping with items from my cameo accessories shop, www.etsy.com/shop/archetypestudios . 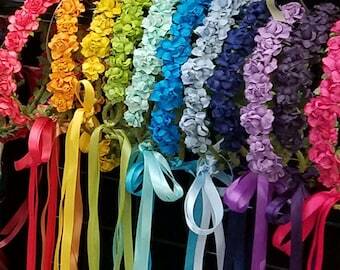 Please convo me after your orders are placed! Also, if you are local to NYC and would prefer to pick up your items in person, please inquire about arranging a meet-up within Manhattan or the surrounding areas. I am happy to provide this service on a limited basis whenever possible. Please feel free to contact me if you have any questions, if you are seeking multiples of similar items, or if you have custom requests.